The 2016 GFWC Annual Convention in Baltimore, Maryland is right around the corner and if you still have to register, now is the time. Hundreds of GFWC members go to Convention and always go home with memories that last a lifetime. You wouldn’t want to miss out on all the fun! 1. Catch up with your Federation Sisters. There’s nothing better than catching up with longtime friends. The GFWC Annual Convention allows you to reunite with all of your Federation sisters from around the world, share ideas and inspiration, and celebrate everyone’s accomplishments with GFWC contests and awards. 2. Indulge in a Well-Loved Tradition of Maryland. Join us at the “After Party” Maryland Crab Feast on Saturday, June 25 where you can eat as many blue crabs as your heart desires. Never picked a crab before? We’ll have an instructor on site to help you! Or if crabs aren’t your thing, there will be a variety of other food available as well. Once you’ve had your fill, dance the night away to the sounds of Billy Logue. 3. Explore the “Charms” of Charm City. Whether you decide to explore on your own or join us for one of the three GFWC-hosted tours, you will quickly discover the charismatic and historic culture of Baltimore. The three tours offered this year include the Star Spangled City Tour where you’ll learn about the War of 1812 and the creation of the Star Spangled Banner, the Great Art in Baltimore Tour where you’ll discover both local and global art, and the B&O Railroad Tour where you’ll visit the first commercial railroad in the United States. 4. Get Wacky with Artist and Author Suzy Toronto. The “Gathering of the Goddesses” Gala and ESO Breakfast on Tuesday, June 28 will be a blast with the zany and crazy Suzy Toronto as the featured speaker. Suzy is a well-known and colorful artist who will no doubt bring loads of fun with her to Convention. 5. Meet New Friends. New to GFWC or just want to expand your network? The GFWC Annual Convention is the perfect place to meet people like yourself who believe in the GFWC mission, history, and spirit. Meeting new people at the GFWC Annual Convention creates a network of learning, sharing, and inspiring. 6. Celebrate one last time with International President Babs Condon and the 2014-2016 Administration. Bid Farewell to the 2014-2016 Administration as they host their final Convention and celebrate all that the administration has done for GFWC. There is no better way to thank International President Babs J. Condon than Living the Volunteer Spirit in her home state of Maryland! 7. Meet the 2016-2018 Administration. Be among the first to congratulate the 2016-2018 GFWC officers as they take their new positions. The installation banquet, ceremony, and reception all take place on Wednesday, June 29 and will surely be a night to remember! 8. Lend a Helping Hand to Baltimore’s Homeless at the Sisterhood of Service Luncheon. 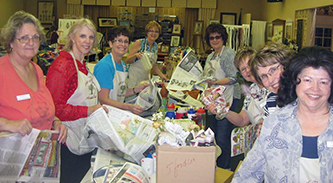 The 2016 GFWC Convention service project will be one of our biggest yet! This year, we are teaming up with the Weinberg Center – a low-barrier shelter that provides services to Baltimore’s homeless population. With your help, we will provide much needed donations of toiletry bags, home starter kits, and dinner bags. For more information on the Weinberg Center, visit their website here and to learn about how you can help, click here. 9. Buy New GFWC Gear from Marketplace. The GFWC Marketplace often introduces great new products at Convention and this year is no exception! This year, we have 8” x 10” double matted gifty art prints and acrylic tumblers, featuring the Collect for Clubwomen and artwork by guest speaker Suzy Toronto. Be sure to stop by the Marketplace to get your commemorative merchandise! 10. Get Direct Access to GFWC Partners. Get direct access to our partners via the Partner Power Luncheon, Partner Workshops, and Partner Office Hours. These events and activities allow you to connect with the organizations who work with us to improve our communities and make the world a better place. Take the time you have with the partners to share your stories and experiences, discuss ideas, answer any questions about their organizations that you may have, and more! Bonus Reason: Save money on Convention this year by registering as an All-Inclusive Attendee. This NEW deal allows you to pay one discounted price ($675) for registration and meals. The price includes your general $150 registration, all five banquets (Saturday-Wednesday,) four luncheons (Sunday-Wednesday,) and one breakfast. You’ll save a total of $50 and won’t have to miss out on any of the Convention fun! Need more information on Convention? 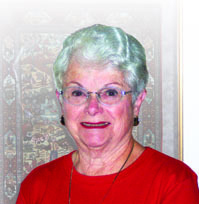 Visit the Convention web page or check the Call to Convention from the March+April edition of Clubwomen Magazine. Remember to take the GFWC Shares Polls to vote for what you’re most looking forward to!